Fat and Happy Blog: Strange Ingredients! Recently I was window shopping on Devon Street in Chicago; this area is also known as Little India. The streets are lined with great shopping, -you can find beautiful sarees, Indian knick knacks and fabulous restaurants (I find the tiny hole-in-the-wall one's the best!) 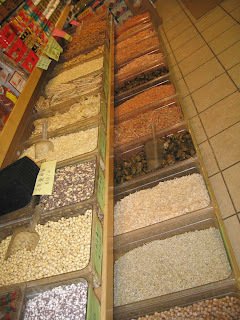 But there are also wonderful grocery stores as well which are filled with authentic ingredients like fruits I've never seen before, bags of flattened rice bigger than me and dirt cheap spices!. Then there's Chinatown where I encountered these great little stores that are packed with open air ingredients like dried seaweed and dried octopus...everything was dried (I must tell you, these stores have quite an odor to them!) When was the last time you picked up an item at a grocery store and felt like your head was swimming and the walls were closing in? It's an odd feeling to pick up an ingredient and have no idea what to do with it or if it's even edible! A couple of friends, Alina and Aaron were visiting a few months ago and we were discussing this blog, see the posting with them in early January. They had a great idea ... to offer viewers a chance to send me a crazy ingredient and I would then need to come up with a recipe for it. I love this idea. It can be what you find in a spice shop or in an ethnic grocery store. How exciting! So imagine my surprise when I opened my mailbox today and found packets of spices from Alina and Aaron. And so it begins. Without hesitating I started cooking. Look for my postings on lavender and Himalayan pink salt coming soon. Until then, next time you pick up an ingredient and feel dizzy - send it to me and I'll have you feeling fat and happy in no time!